Aaron McEneff turns away to celebrate after his cheeky penalty ends up in the back of the net. STEPHEN Bradley claims he would've sent Aaron McEneff back up the M1 with Derry had his cheeky 'Panenka' penalty gone wrong on Friday night. The Shamrock Rovers boss watched on from the stands as McEneff cooly chipped his spot-kick down the middle of the goal on 80 minutes to seal victory over the Candy Stripes in Tallaght. Bradley has watched the midfielder regularly practise his penalties after training but has never seen him hit one like he did on Friday night. 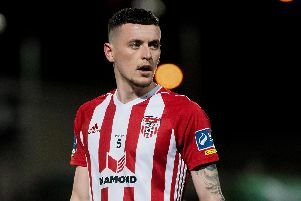 With the game still in the balance at that stage, it take a lot of bottle from the player to attempt his audacious spot-kick and fortunately for the Derry native, it his the back of the net. "He's lucky he scored that or he'd be heading back to Derry," laughed Bradley afterwards. "I wasn't expecting that finish to be fair. They were practising them after training on a Thursday but I've never seen him hit one like that. McEneff celebrates his first goal for Shamrock Rovers in his home debut against his hometown club Derry City. "Honestly if it hadn't of went in he'd be heading back up the motorway with Derry - I wouldn't have been happy but I'm delighted he scored." The Rovers boss has been impressed with his new recruit and believes he's only going to improve as the season progresses. "He's been brilliant. We knew he'd get goals. That's what he does - he scores goalsbut his all round play has been very good. He's worked hard off the ball. I believe he's become a better player defensively. "In the first half his defensive positions were really good which is not something Aaron is renown for. "So I've been working with him on that a lot because I know he gives us the other stuff." Bradley was serving the second of his two match suspension carried over from last season and with two wins from two, it hasn't seemed to have had much of an impact. Although his team were made to dig deep for the win against the Candy Stripes. "We had to dig in to win a scrappy game which it turned out to be. "It's vital we get as many points on the board as quickly as possible. That's what tonight was all about - getting the three points. "We felt it would be scrappy and it turned out to be but we're delighted with the win.